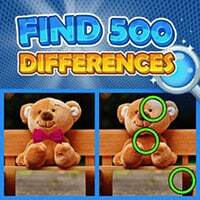 Find 500 Differences: Train your brain in this fun puzzle game! Look at the two photos which seem identical and try to find the 5 differences. Can you spot all of them? Simply tap on a difference to mark it. Be careful: tapping a wrong spot will give you a time penalty. Be quick to earn 3 stars per level and complete over 100 levels with beautiful images! You can play this game on all devices. So enjoy and have fun in playing Find 500 Differences Game. Good luck. This game is one of our spot the difference games at Hidden4Fun. This game is also tagged as a skill game. To play even more free games, view our most played and all games pages. If you want to play more games like this game: Then you can simply check out the games inside the game tags that are the most relevant to your interests or check the Spot the Difference Games category or check the related games section at the end of the game page. Also make sure to check out Daily Difference Game, you may enjoy playing it.